According to the calendar, it is officially Spring, but I don’t think anyone has mentioned it to Mother Nature. And I know it's supposed to get up into the 70s on Saturday, but I'll believe it when I feel it. The chilly mornings, complete with a few snow flurries, this week were getting to me. I decided what better way to deal with them than a warm breakfast that reminds me of dessert. This year I became a Siggi's ambassador. Siggi's is a brand of Icelandic yogurt called skyr. It's a strained yogurt from cow's milk that is extra thick and creamy. It's made with real ingredients, not much sugar, and is jam-packed with protein. There is no aspartame, no sucralose, no gelatin, no artificial colorings, no preservatives, no high fructose corn syrup, and it is non-GMO verified. What does it mean to be an ambassador? Well, I don't get paid, but I do get the chance to participate in fun monthly challenges with the potential to win prizes. More importantly, I get access to coupons and things that I can share with all of you. This month's challenge was to make a recipe from the Siggi's website. There are a bunch, but I immediately searched for warm, cozy breakfast ideas. And, of course, I had to make it my own by tweaking a few of the ingredients. 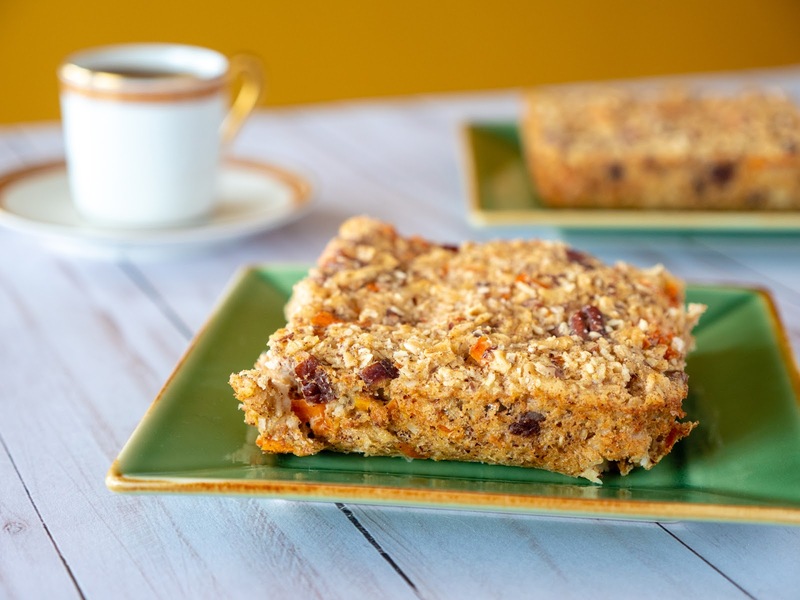 This baked oatmeal is a healthy make-ahead breakfast dish that’s packed with all the delicious flavors you’d expect in carrot cake. The hearty combination of oats, flax, carrots, milk, eggs, Siggi's, and spices will keep you going all morning. I left out the raisins, but you could definitely throw some in for an added pop of sweetness. Preheat oven to 375 degrees Fahrenheit. Lightly grease an 8 x 8-inch baking dish with butter or coconut oil. In a large bowl combine oats, flaxseed, cinnamon, ginger, nutmeg, and a pinch of salt. In a separate bowl whisk together milk, Siggi’s yogurt, eggs, vanilla, and maple syrup. 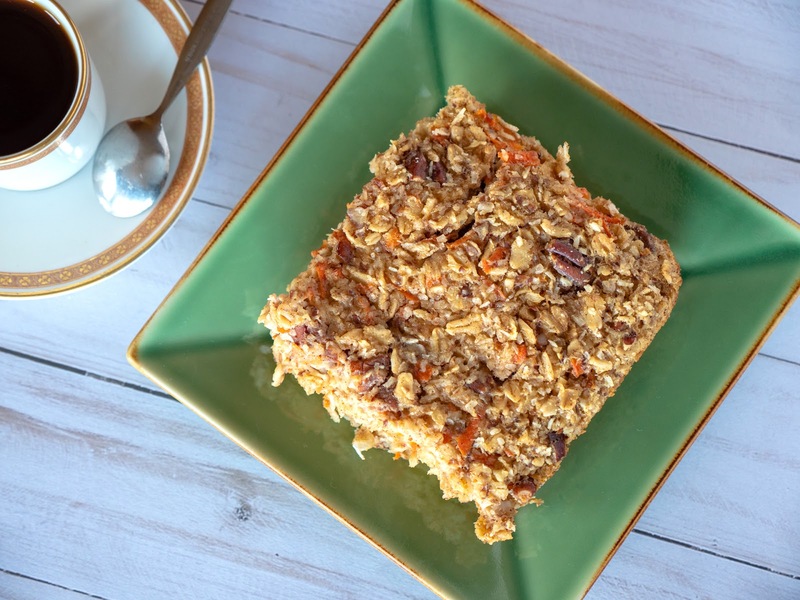 Stir in grated carrot, coconut, and pecans. Pour mixture into greased baking dish and bake for 30-35 minutes, or until set. Remove from oven and cool for at least 10 minutes. That looks delicious! How well do you think this would do as a make-ahead dish that you reheated as needed for breakfast? I think it would reheat well. It’s pretty moist so I don’t think it would dry out. Looks tasty! I’ve only eaten Siggi’s straight out of the container. Never thought of baking with it. Same here! But since it worked so well in this recipe, I'm thinking of trying it in pancake batter next. I’m the only one who eats breakfast so I’m going to see how this holds up to portioned freezing! It's a great way to use up oatmeal. Oh my I could dig into this. Looks so yummy and I am sure moist using the yogurt. The yogurt definitely gave it a good consistency even when reheated. I want several servings of that.